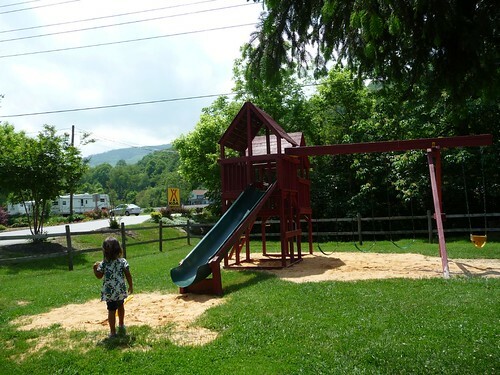 Mali Mish – Day 89: Into the Great Smokies. Last night getting to Asheville, North Carolina was another late one. Google Maps let us down again and took us to a Walmart that was not there. 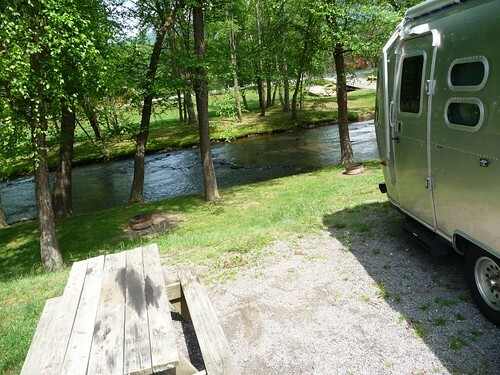 Running low on fuel and driving in the windy and narrow roads of the Great Smoky Mountains looking for an alternate boondocking place caused just a little bit of anxiety for Marlene. We woke up in the morning and got a real sense about what the Great Smokies are all about. The fog sure makes everything a little blurry. 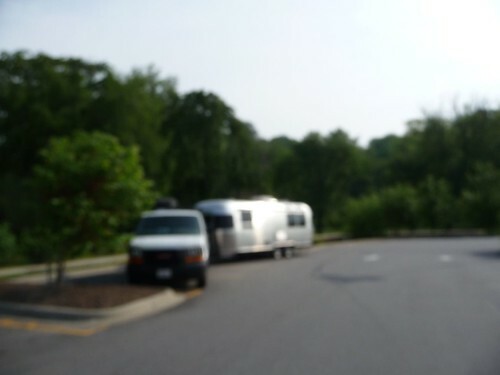 Or maybe that’s just our camera..
After breakfast at McDonald’s inside Walmart just as we always do, we found our way to the KOA on the east end of Asheville, NC. It is about 10 miles outside of town and in a beautiful part of the area. We thought initially that we might just stay a couple of nights since we didn’t really have any places we planned on seeing around Asheville. We are really just here because it is on the way to places in Tennessee we wanted to see. Upon check-in, we found out that they were running a special. If we got 3 nights, we would get a 4th free. 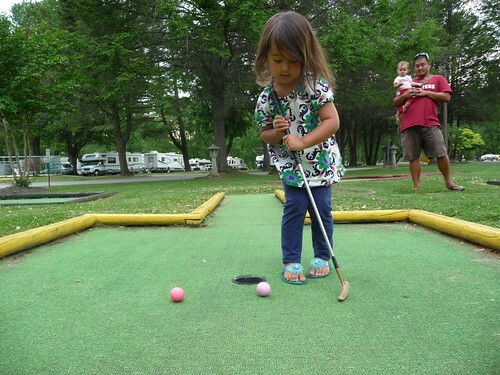 On top of it, our KOA membership card discount can also be applied. As a sucker for a good deal, we decided to stay awhile. 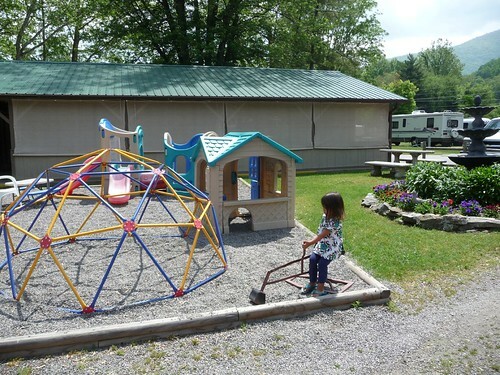 It came out to be about $24 a night which is pretty hard to beat for a KOA. We got one of these great sites right on the river. It is also a full hookup sites that includes sewer and cable. We haven’t had full hookups probably since Fort Wilderness in Disney World. 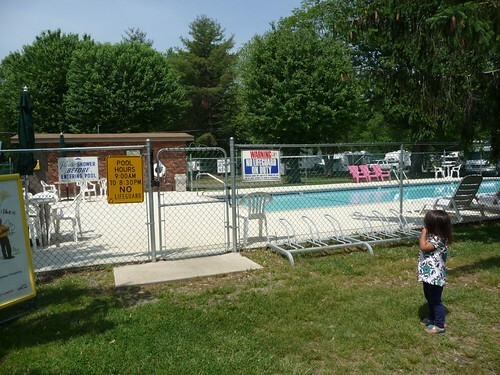 As you would imagine, being a KOA, there are lots of other amenities like a swimming pool. It’s a little chilly not being heated but I am sure Ava won’t mind. And of course a playground. Having cable TV hookup usually isn’t that big of a deal for us. We can get some channels over the air if we are in a metropolitan area or if we don’t, we don’t really miss watching TV that much. Here however, the cable TV is a much welcomed bonus for me since my Lakers are now advancing further into the playoffs of the NBA post season. These games are licensed to only ESPN and TNT cable channels and short of going to a sports bar, I have no chance of catching it without it. Along with the river, we also have free roaming wildlife that are accustomed to human interaction. 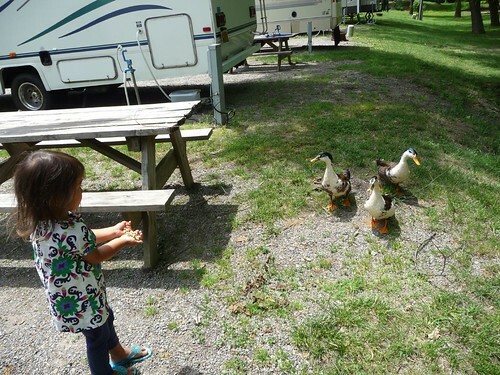 Here are some panhandling ducks looking or handouts from Ava. In the last week or so, Mila has been running a little hot. In the last few days she has been really uncomfortable and fussy with periodic temperature surges upwards of 102. We decided to take her to urgent care just to be on the safe side. 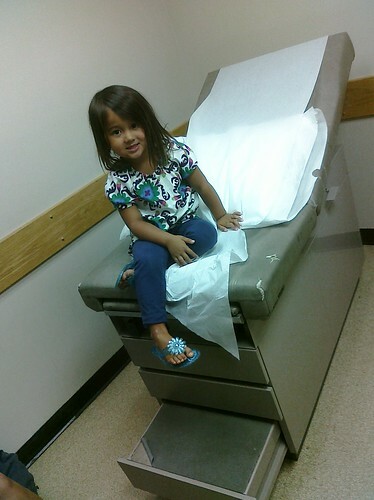 While we are there, we also wanted to get Ava checked out a bit. She has also been complaining about some discomfort when going to the bathroom but nothing unusual was found. The only thing we got from Ava’s check up was Marlene’s hand getting a little wet trying to catch some of her urine sample using a plastic cup. 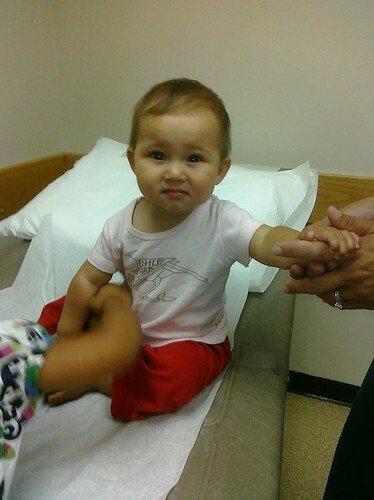 As expected, Mila was running hot again and the urgent care doctor also found an infection in her left ear. He wrote us a prescription for some antibiotics and sent us off the Walgreens across the street to get it filled. 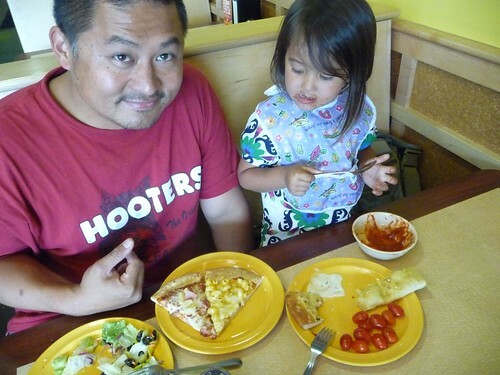 While getting the prescription filled, we had lunch at the Cici’s Pizza next door to it. Our Boca Raton buddy Paul loves this place. He tried really hard to get us to go with his family while we were there but we for some reason we never did. At $4.99 a person for all-you-can-eat dinner, it is ridiculously cheap. There you go Paul, this one’s for you. When we got back to Walgreens, for one reason or another, they couldn’t figure out how to process our insurance card. They then claimed that they were out of the common antibiotic Amoxicillin and kindly called our order to the next Walgreens a few miles down the street. Being a bit annoyed that we are running all over town to get a common antibiotic filled, we got to the other Walgreens and they got it ready for us and sent us on our way. 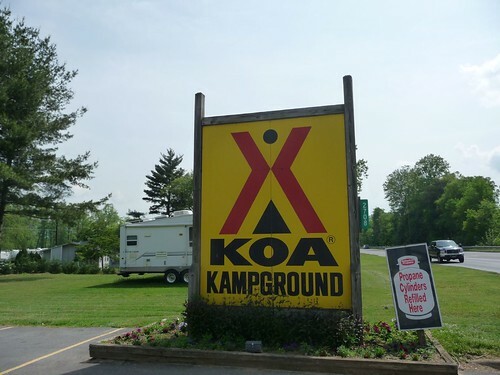 We are now a good 15-20 miles away from East Asheville KOA and started to head back in afternoon traffic. Just as we are nearly there, we got a called from Walgreens alarming us that they had mis-filled our order. Now we had to drive all the way back to get the drug swapped out. For our inconvenience, they didn’t charge us for the scrip. The $12 we saved just barely covers the 4 gallons of gas it probably took us to make the extra trip. 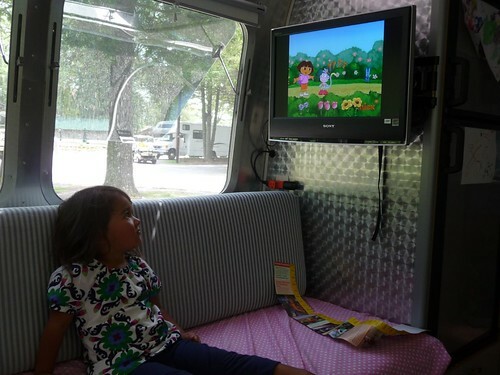 When we finally got back to the KOA, we decided to take advantage of the onsite amenities. Did I mentioned they also have a mini golf course? Day 90: Asheville, North Carolina. 4 Responses to Day 89: Into the Great Smokies. Welcome to North Carolina! I’ve been in the Raleigh/Durham area for ten years now. NC is a neat place, especially the mountains. Thanks Brian! We intended on spending a lot of time in North Carolina initially including visiting the Raleigh area but unfortunately Asheville is the only place we have time for now. We hope to come back for a much more thorough visit next year. I am especially disappointed that I am going to be missing the Doughman Challenge! I hadn’t seen the Doughman before! The Krispy Kreme Challenge, which kicked off the donut-racing phenomenon, is held at N.C. State University (go Wolfpack!) in Raleigh every February, if that suits next year’s timetable better.